The Michigan State University Archives hold materials that are decades and even hundreds of years old. Recently, pulled from the shelf was a scrapbook from a student that graduated from this university in 1915, exactly one hundred years ago. 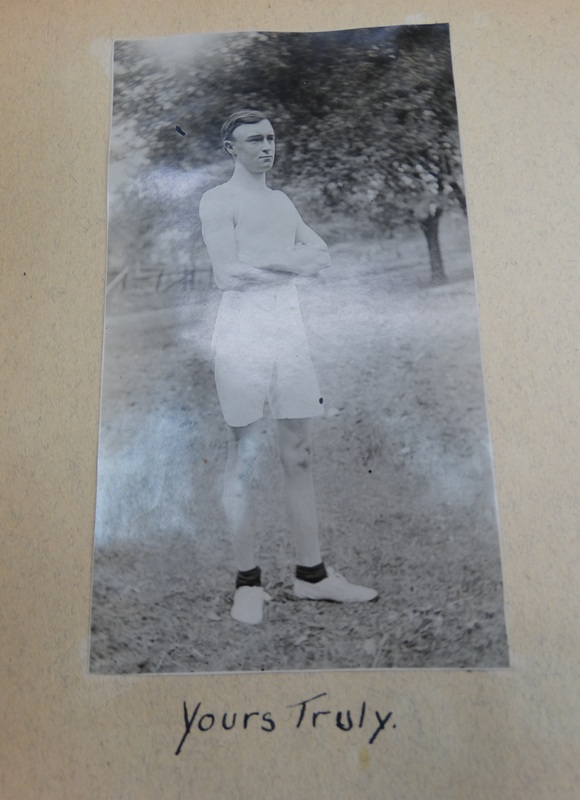 Leon L. Budd’s memory book has specific pages for events to record throughout his college career. He records the scores of various sporting games and writes “Yell – Rah! Rah! Rah! Uzz! Uzz! Uzz! M-A-C!”. 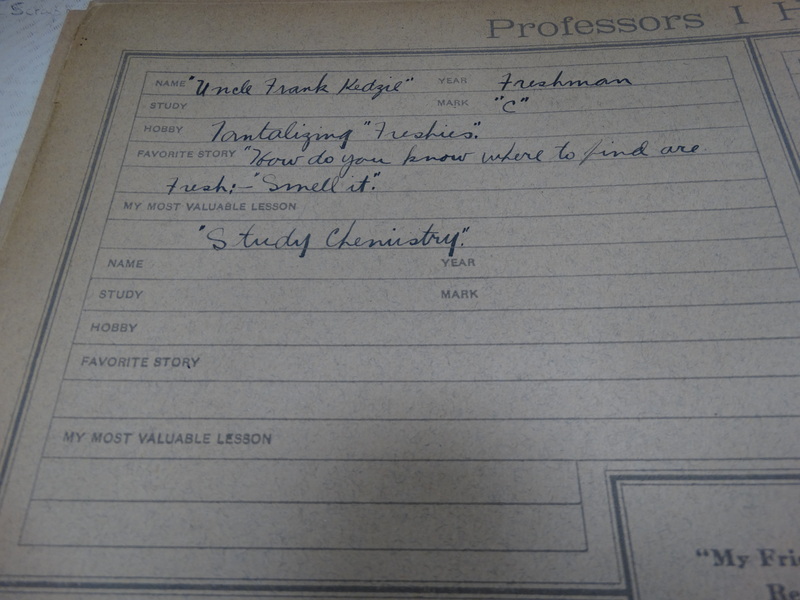 There is even a section for interactions with professors, where Budd notes that one of the most valuable lessons he learned was to “study chemistry”. 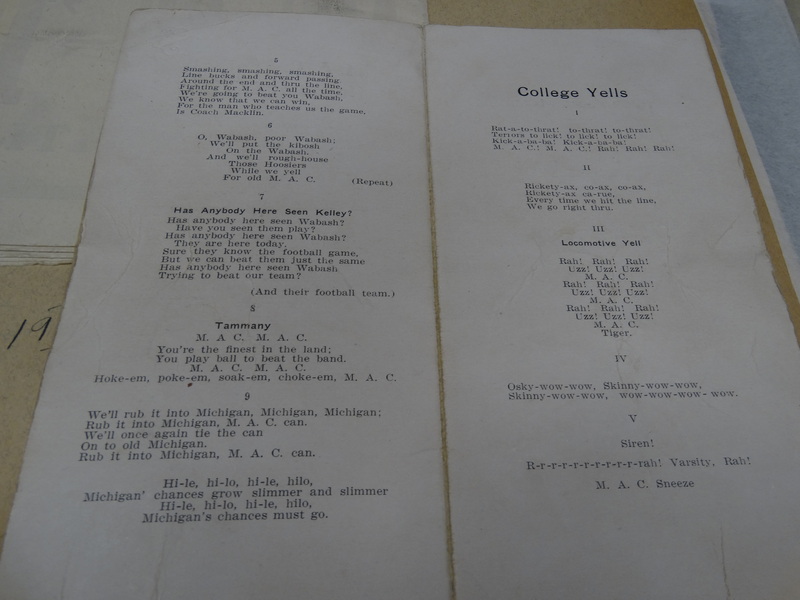 The next section lists his dear friends, along with their happiest memories at Michigan Agricultural College. “It’s never late till 12 pm and it’s early after that” wrote John S. Hancock of Hart, Michigan. Budd’s friends proved to have some fun with the advice “If you can’t be good be careful”. 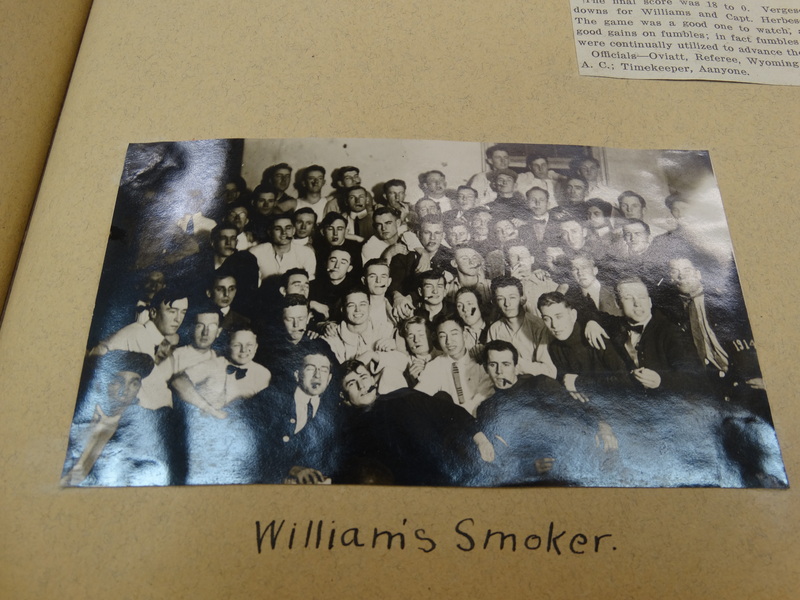 A couple students bonded over their hall placement with the saying “To Hell with Wells and Abbot its Williams Hall for us” and the rivalry continued “To H—L with Williams – Wells is The Gentlemen’s Dorm”. Rub it into Michigan, M.A.C. can. 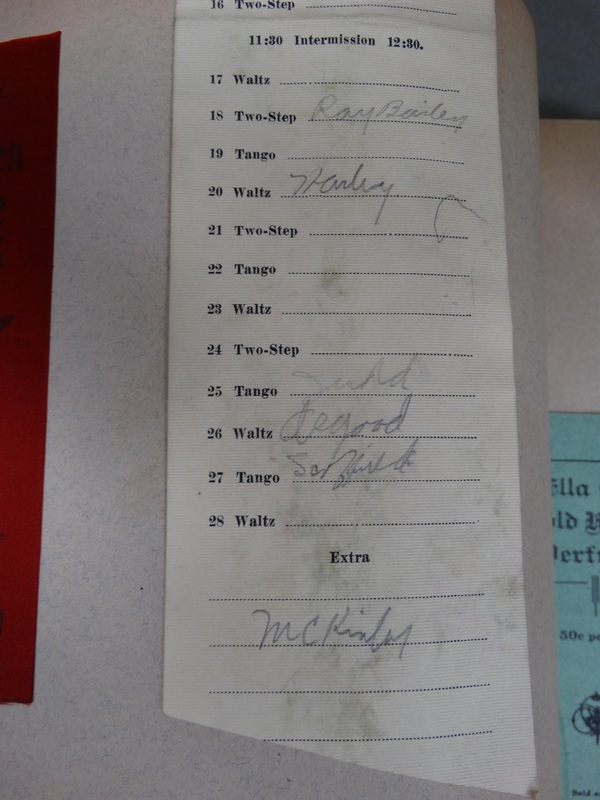 School dances were also recorded, with marks next to the name of the dances done at a party. Budd attended quite a few dance parties during his time at Michigan State. Mr. Budd also has some memorabilia from days as an engineering student. 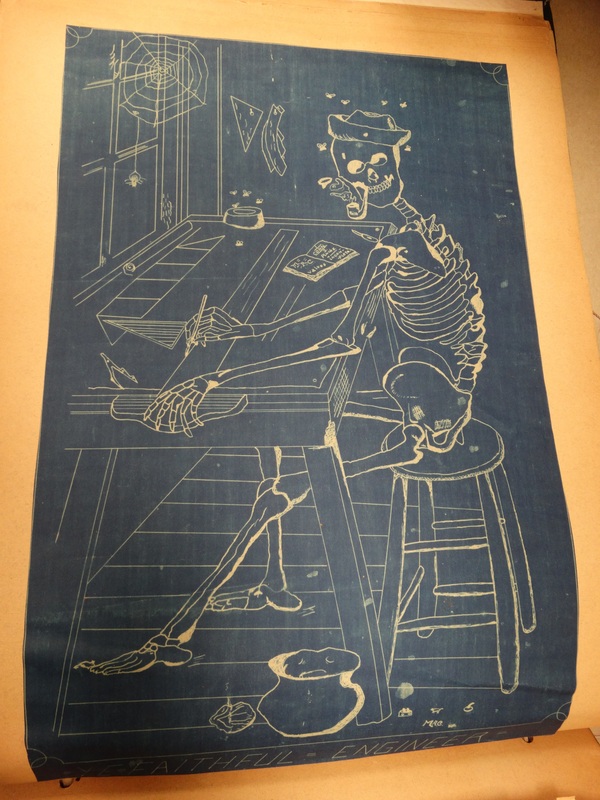 One poster depicts a skeleton at a desk with an open book to “MAC valves”. The bottom of the poster reads “=Ye=Faithful=Engineer=”. 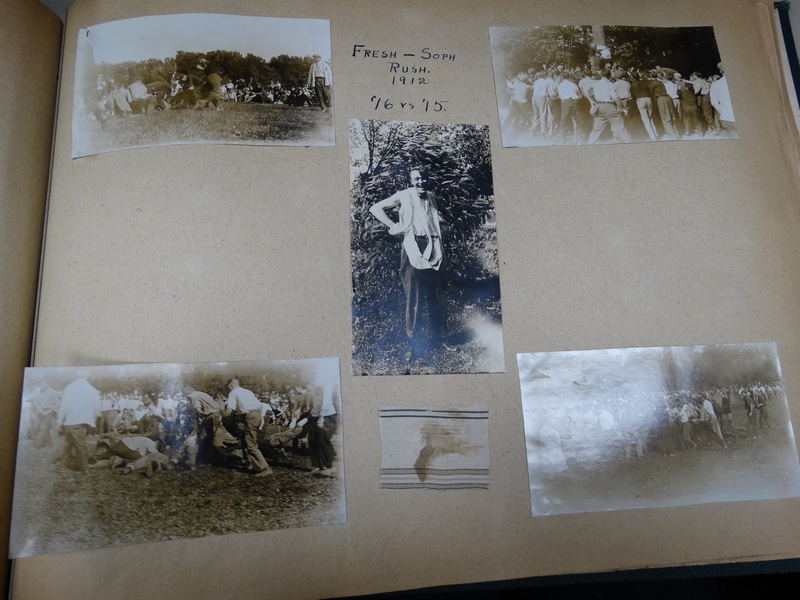 The following pages are filled with pictures from Leon Budd’s time at MSC. They include the “Fresh-Soph Rush. 1912. ’16 vs ‘15”, places on campus, his friends, his love interest, and himself. Following those are pages of classic scrapbook findings, the football program, class schedules, and newspaper clippings from the games. We really get a glimpse into life at Michigan State during Leon Budd’s time here. The buildings have changed, the style is different, and the course options have diversified, but the smiles and comradely seen between Budd and his classmates seem to be an everlasting effect of time at Michigan State. 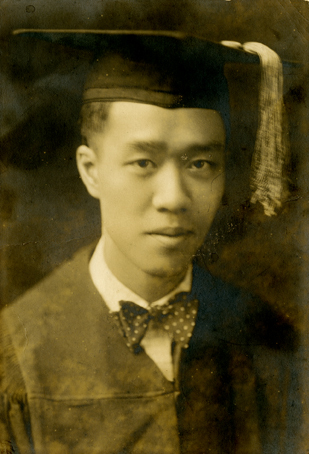 Onn Mann Liang can be seen here in 1926, in his graduation cap and gown. International students have been studying at Michigan State University for over 140 years, which the Archives’ new exhibit – International Students at Michigan State – outlines over here. 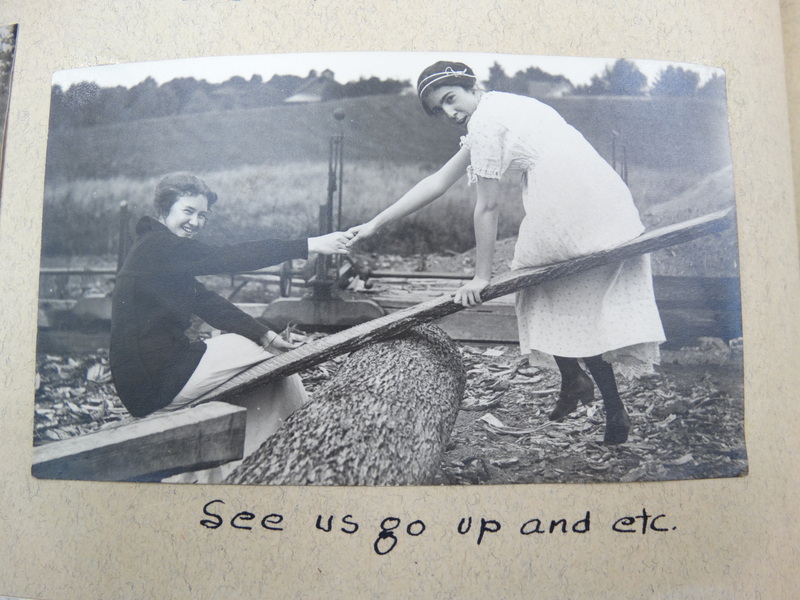 Recently, the scrapbooks and work documentation of one such student, Onn Mann Liang, have been uploaded to our On the Banks of the Red Cedar website almost in their entirety. These donated materials provide the story of Liang’s life, mainly in pictures and a few brief correspondences, from late high school until the year before his death in 1957. Being an Engineering major, Liang seemed to have a fascination with bridges. 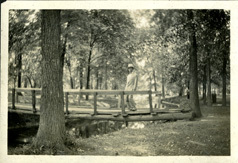 This image is one of many he took of various bridges while in the US, and it shows him on campus standing on a small wooden structure. 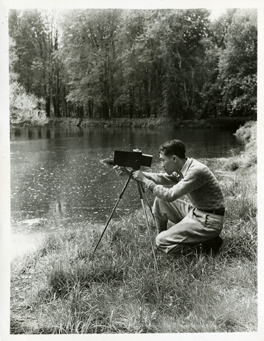 Liang was a prolific photographer, especially of MSU’s campus. This particular image appears to be on a bank of the Red Cedar River. finally posing in his long-awaited cap and gown. While he was still attending school, Liang was known for the quality of his photographs (even winning a few awards), and his shots were good enough to open a photography studio in Lansing. Liang took this picture while in Chicago in 1928. The La Salle Street bridge is foremost in this image, but another two can be seen in the background. After completing his undergraduate studies in 1926, Liang spent the next six years in the US travelling to various cities while also working for the Michigan State Highway Department. 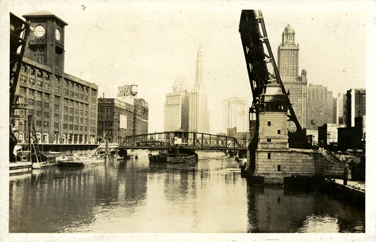 Scrapbook images of Chicago show such famous buildings as the Tribune Tower as well as the La Salle Street Bridge – which was built and completed throughout the year of 1928, and, as a bridge enthusiast, could very well have been the reason for Liang’s visit to the city. Within the next two years his travels also brought him to Buffalo, before he came back to Michigan and began working full time with the Highway Department. Some of Liang’s final photographs include him among coworkers at the Department, prior to his return to China in 1932. 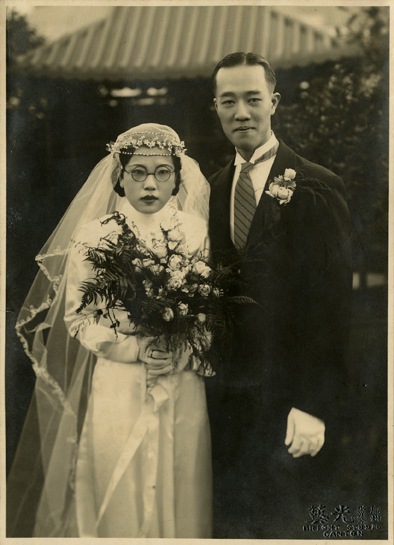 This image shows Onn Mann Liang and his wife on their wedding day in 1936. Wedding photographs from 1936 and registration documents as a Civil Engineer show Liang’s quick integration back into Chinese life. Employment papers from the same period reveal Liang’s work as a primary engineer of dyke and bridge plans throughout his native country, which, just as with his time spent at the Michigan State Highway Department, was a direct application of the education he received from MSU. After processing the Liang scrapbooks, it becomes apparent that he carried that education with him, even up to the last years of his life. The final image of the Liang scrapbook shows him on a return trip to San Francisco alongside his wife and son – with the Golden Gate Bridge receding behind.